He began his night by powering from the second starting spot in his heat race to the heat victory, which locked him into the pole position for the feature event. As the green flag dropped on the feature he motored away from the competition and never looked back on his way to his third win of the season, which came over Hunter Duren, Robby Skinner, Robby Moore, and Gavin Landers. June 22nd, 2013 - Engine woes couldn't keep Chandler away from action over the weekend as he put his 604 Crate Late Model engine in his #47 Rocket Super Late Model and resumed action with the COMP Cams Super Dirt Series (CCSDS). Despite being underpowered compared to his competitors he enjoyed a pair of strong runs. On Friday evening the COMP Cams Super Dirt Series (CCSDS) Super Late Models sanctioned their first-ever event in the state of Tennessee with a trip to Camden Speedway (Camden, Tennessee). Twenty-four Super Late Models entered the $2,000-to-win event, and handling issues in his heat race left him starting nineteenth on the grid for the evening's 35 lap finale. Despite starting deep in the field he passed eleven cars to finish in the eighth position. 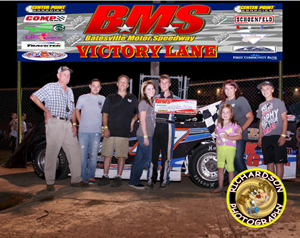 Saturday night took the team to Riverside International Speedway (West Memphis, Arkansas) for another $2,000-to-win event. Petty raced to a third place finish in his heat race, which positioned him starting eighth on the feature grid. For the first half of the finale he raced in the top five before crossing the finish line in sixth behind race winner, Ross Camponovo, Ashley Newman, Jon Kirby, Robert Baker, and Jeff Floyd. Chandler is now tied for fourth in the latest CCSDS standings. Complete standings and full results from the weekend are available at www.COMPDirt.com. June 15th, 2013 - Chandler competed with the P&W Sales Southern United Professional Racers (SUPR) Super Late Model tour on Friday evening at I-30 Speedway (Little Rock, Arkansas) in an event that served as the opening round of a doubleheader at the 1/4 mile oval. Twenty-three Super Late Models were on hand, and after starting seventh in his heat race Petty was involved in a chain reaction tangle that forced him pitside. As a result he started nineteenth for the feature before retiring early to a twentieth place finish. On Saturday evening twenty-seven entries converged on the 1/4 mile oval, and Petty started his night on a great note by winning his heat race from the second starting spot to earn the second starting spot for the main event. In the feature he was running a strong third, when bad luck struck as his motor expired, ending his night in the 19th position. Full results from the program are available at www.SUPRRacing.com. June 8th, 2013 - After a few weeks away from the track Chandler Petty Motorsports returned to action with the COMP Cams Super Dirt Series (CCSDS) Super Late Models over the weekend at Northeast Arkansas Speedway (Harrisburg, Arkansas) in the 3rd Annual Rockabilly. On Friday evening a $1,500-to-win program was held at the 1/4 mile oval as thirty-nine entries registered for battle. The program started with Petty rocketing from the sixth starting spot to a second place finish in his heat race, which locked him into the fourth starting spot for the main event. He was running third in the 33 lap event, when contact from Brad Looney caused him to slip back to ninth. Over the remainder of the race he charged back to a sixth place finish. Saturday night found the winner's check increased to $3,000-to-win, and after finishing third in his heat race Petty fell short of locking into the feature. As a result he ran a b-main, which he won to lock into the fifteenth starting spot for the 45 lap finale. In the main event Petty was running thirteenth, when a broken wheel brought his night to an abrupt end in the eighteenth position. Chandler is now fourth in the latest CCSDS standings. Complete standings and full results from the weekend are available at www.COMPDirt.com.